The ECB (Eurosystem) balance sheet continues to decline as the LTRO/MRO loans to the banking system are repaid. We've seen a decline of about one trillion euros in the past year and a half. Anywhere else this would have been considered a massive tightening of monetary policy (imagine the Fed selling $1.3 trillion of bonds). But not in the Eurozone. In fact the area has experienced some significant easing recently. 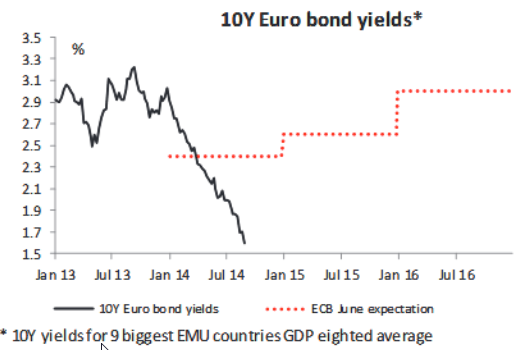 Both the euro and the long-term rates have fallen far below ECB's own forecast. The ECB achieved Japan-style easing without the Japan-style QE. Near-term German rates are now firmly in the negative territory (see chart) - you now have to pay the German government to hold your money for 2-3 years. The central bank was able to loosen conditions while reducing its balance sheet as a result of unexpectedly soft economic reports from the area, falling inflation (see chart) and inflation expectations (see chart), as well as Draghi's jawboning. The ECB got this round of easing "for free", but now markets will be expecting a follow-through from the central bank. And unless we get what amounts to "shock and awe" from the ECB, some of this easing (lower rates and lower euro) could see a sharp reversal.